The 2014 NHL Entry draft wasn't ever going to be something spectacular. There wasn't the pedigree of a Nathan MacKinnon from the 2013 draft or the depth of the 2003 draft. Yet, as always, there were talented players to be had in the top ten picks. That was where the Toronto Maple Leafs found themselves, after a depressing finish to the 2013-14 season. With the 8th, 68th, 94th, 128th, 158th and 188th overall picks, the Maple Leafs were slated to have a shot at several different skilled forward prospects in that top 10. The 38th pick had been traded earlier in the season to the Anaheim Ducks along with Jesse Blacker in exchange for Peter Holland and Brad Staubitz. 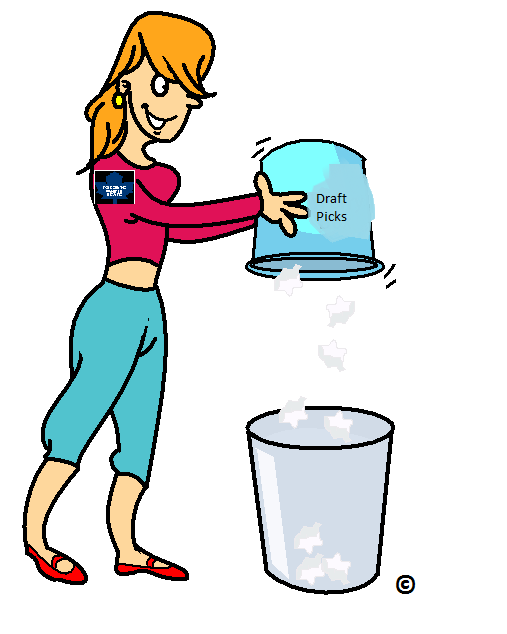 Let's take a look at how the Leafs' draft day went. With the 8th overall pick, there were a handful of talented forwards that the Leafs were tasked with choosing from. 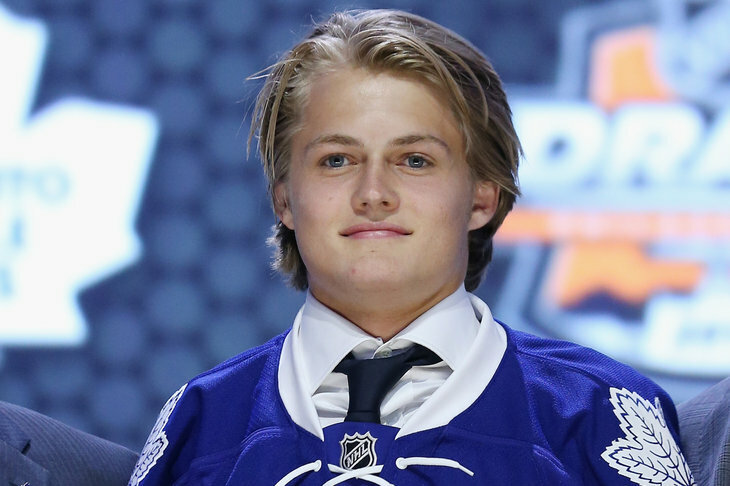 Toronto was happy to select William Nylander (Bill Ny) out of that bunch from MODO of the Swedish Hockey League. Born in Canada to father and former-NHLer Michael Nylander, William grew up in Calgary, AB. After moving to Sweden at the age of 14, he joined the junior development leagues of the Allvenskan league club Södertälje. Later, William would sign with MODO and play for their junior programs, as well as for the main club in the 2013-14 season. William Nylander's skill level is unquestionable. He has been repeatedly mentioned as possibly being the most skilled player out of the 2014 NHL Draft. For the Leafs to have been able to get him at 8th overall, that is a significant sign of future upside. He has tremendous puck handling skill and vision. His ability to control the play in the offensive zone is apparent every time you see him play. From TSN's Director of Scouting, Craig Button, "William exudes confidence when he plays. Exceptional poise with the puck and is always looking to make threatening plays in the offensive zone. Excellent skater who is very difficult to check because of his agility and because he is always changing pace. Can make pinpoint passes in traffic and if you are his line mate, best be ready, as he will provide opportunities. Top line type player." And, from International Scouting Services' Twitter account, https://twitter.com/ISShockey/status/414093041700331520 "A consistent threat; incredible skater & quickness combined w/ elite stickhandling." After signing his Entry Level Contract over the summer, he is eligible to play in one of 4 different leagues next season. Should he make the team, he could play for the Leafs in the NHL. If he doesn't, the Maple Leafs could assign him to their AHL affiliate, the Toronto Marlies. Alternately, they could send William to his Swedish club, MODO, to continue his development. A last, while unlikely, option would be to assign Nylander to the Canadian Hockey League juniors, where he was drafted in the CHL Import Draft by the Mississauga Steelheads. Where he ends up will largely depend on his performance in the upcoming rookie tournament and training camp. From Dave Nonis, "He'll definitely have a chance to make our team. I think it'd be a long shot for him to do that, but he's going to be given that opportunity and if he's good enough to stick and play and contribute, then we would keep him." What I believe Leafs management will do is assign him to the Toronto Marlies. There's simply not enough room on the roster to give Nylander many, if any, regular season NHL games, and his skill level is well beyond playing in European Leagues. Playing in North America will better develop Nylander to playing in the NHL as the rules and ice size are the same. It will also give him an opportunity to start becoming comfortable in Toronto and getting to know and train with people form the Leafs training crew. The argument for playing in the SHL could also be made, as Nylander's comfortability and familiarity there could help him develop areas of his game that are lacking. As mentioned before, the Leafs did not have their second round pick. An uneventful round for Toronto. With the 68th overall selection, the Leafs selected Rinat Valiev from the Kootenay Ice of the WHL. 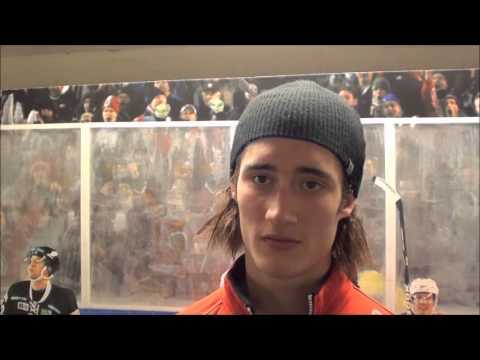 Valiev is a Russian defenseman who had an interesting road to getting drafted into the NHL. Beginning in Russia, playing for Ak Bars Kazan, he came to North America hoping to make the CHL to develop his game. 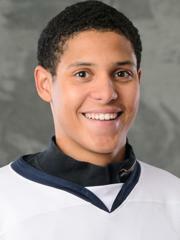 He wasn't drafted in the import draft, and as such he joined the USHL with the Indiana Ice (no affiliation). After a season in the USHL, he was selected by the Kootenay Ice in the CHL Import Draft in 2013. That would have been Valiev's NHL draft year. He was not selected in the NHL draft and thus played an above age (not technically over-age) year for Kootenay before being selected by Toronto in the 2014 NHL Draft. It seems that Toronto reached on a player who no one really projected to go in the third round. However, this could still end up as a solid depth defenseman pick. What Valiev brings to the game is a strong two-way ability. He's not offensively flashy, and isn't much of a point producer, but he'll be in the right places in his own end and able to carry the puck and move it to the forwards. He considers himself an offensive defenseman, but similar to players like Olivier Ekman-Larsson (similar in style, not ability), he is intelligent and be confident in coverage in his own zone. Valiev signed his Entry Level Contract days after being drafted. He is not eligible to play in the NHL, so his course of action is to either go back to junior to play for Kootenay, or go back to Russia and play for Kazan. Likely, the Leafs will assign him to Kootenay to continue his acclimation and growth on the North American ice surface. The Leafs had two picks in this draft, their own selection at 98, as well as Phoenix's selection at 94 from a deal sending Matthew Lombardi to Phoenix. The 98th pick was traded on the draft floor to St. Louis, in a trade sending Carl Gunnarsson with Roman Polak coming in return. In my opinion, this trade was a backwards move if you only consider the personnel. When you consider that the Leafs also sent a draft pick, as well as retaining $200K of Carl Gunnarsson's salary, this was definitely a trade that makes you think. What the Leafs get in Polak is a 4/5 physical defenseman. What they had was a 2nd pairing two-way defenseman who had been miscast as a top pairing defenseman. It appears the Leafs made this move solely to have a change in personnel, which I believe is misguided at best. On to the actual selection, with the 94th pick, the Leafs selected J.J. Piccinich from the Youngstown Phantoms. A playmaking winger out of the USHL, Piccinich is a creative offensive player. He struggles with a bit of hot/cold syndrome, but that is likely more an issue of bad luck than it is of player effort. Piccinich is committed to Boston College next season, a powerful NCAA program where he will be playing highly competitive hockey. He'll have an opportunity to play with top 2 2015 selection Jack Eichel, which would be sure to boost his offensive production and growth. Potential-wise, Piccinich could be a bottom 6 production guy given time and the right situation, and Boston College is quite the positive situation to be in. Joshua will be returning to Sioux Falls in 2014 with, hopefully, more of the offensive burden placed on his shoulders. While he works on filling out and offensive production, Ohio State will be anxiously awaiting his arrival for the 2015 NCAA season. With the 158th pick, the Leafs went back again to the United States, this time picking from USPHL's South Shore Kings, taking Nolan Vesey. Vesey is a small, speedy forward who put up good numbers in the USPHL. He has some issues with "cherry-picking" and inconsistency, but these are things that go away with maturity. His offensive skills were apparent in the Leafs' rookie camp, looking like one of the better forwards at the camp. Vesey is committed to the University of Maine, where he will compete for ice time on a fairly average Maine team. His path to the NHL will surely involve all 4 years of college and some time in the AHL, if he gets there. It wouldn't be out of the question for someone who possesses the raw skills that Vesey does. Continuing a trend in the Leafs' scouting department, the Leafs take their 7th pick to Sweden, trusting it in the hands of European scouts Thommie Bergman and Peter Ihnacak. This year, selecting Pierre Engvall from the Frölunda junior development program. Engvall is a big kid, a power forward still growing into his frame. Justin Fisher from TheLeafsNation.com said on Twitter, "for me, Engvall has everything you'd want in a winger: big, skilled, etc., but he's only played in Junior so far. I would love to see him force his way on to the Frolunda men's team this season, but in all likelihood it's another year in J20."